Renew your support for 2011. 2010 was an incredible year for the Center for Biological Diversity. We won protections for endangered wildlife like polar bears, wolves, steelhead trout and sea turtles. We stopped massive attacks from Big Industry and Congress. We secured the designation of 166 million acres of endangered species habitat preserves. And the year-end generosity of more than 3,400 people enabled us to reach our goal of $150,000 for our Endangered Species Action Fund during the holiday season. Thank you -- and thanks to the hundreds of thousands of others at your side -- for joining us in the fight to save our planet's priceless biodiversity. 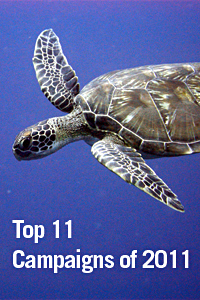 For our first online newsletter of 2011, we want to share with you our top 11 campaigns to save hundreds of America's most endangered species in 2011. Enjoy reading, and thank you again for taking action and giving your time and money to the Center. Last year held major wins and losses for the noble polar bear, which earned the biggest federally protected "critical habitat" designation in history -- an immense 120 million acres -- but was also denied the full protection of "endangered" status under the Endangered Species Act by Interior Secretary Ken Salazar. In 2011, the Center for Biological Diversity will beat back Alaska's effort to revoke the habitat reserve and force the Interior Department to elevate the species' protection level to endangered, which will safeguard the bears from their number-one threat: global warming. We'll also add to recent court victories to block offshore oil drilling in the bears' Alaska home, including the Chukchi Sea, Beaufort Sea and Western Arctic Reserve. Learn more about polar bears, our critical climate work and Arctic oil development. The new Congress has wolves in its crosshairs -- joining states, the feds and the livestock industry in their push to gun these top-level predators into extinction. In 2010, Mexican gray wolves were down to just 42 individuals and two breeding pairs, while Endangered Species Act protections for all U.S. gray wolves -- including Great Lakes and northern Rockies wolves -- were under constant attack. The Center for Biological Diversity will stand strong in our bid for a full recovery plan for endangered gray wolves across the country, which calls for wolves to be restored to suitable habitat in the Pacific Northwest, California, southern Rockies, New England and Colorado Plateau. We'll defend all wolves' federal protections, work for special protections for Mexican gray wolves and stop wolves from being hunted and gunned down from the air in Alaska. Get details on our campaign to restore the gray wolf. Then take action to stop the aerial shooting of Alaskan wolves. Overfished for decades and still fetching top dollar at sushi restaurants, bluefin tuna are heading toward extinction. In 2010, the Center for Biological Diversity filed a scientific petition to get Atlantic bluefin on the endangered species list, and we'll fight in 2011 to make sure this extraordinary fish -- warm-blooded, fast as lightning and up to 10 feet long -- gets the protection it urgently needs to survive. We'll also reduce the consumer demand that's driving overfishing. Already, more than 23,000 people in 99 countries have signed onto our boycott of bluefin tuna, and restaurants around the country have pledged to keep it off their menus. This high-profile, high-impact campaign continues as we call on more restaurants and consumers to help keep bluefin alive in the water, not dead on a plate. Check out our Bluefin Boycott, learn more about Atlantic bluefin tuna and sign our pledge not to eat bluefin. In 2011 the world's human population will hit a staggering 7 billion. The planet can't support this many people and all its ecosystems and wildlife too. No other national environmental group has done as much as the Center for Biological Diversity to launch an intensive national discussion about overpopulation, overconsumption and how those forces are driving species extinct across the globe. In 2010, we distributed 350,000 of our wildly popular Endangered Species Condoms through a network of 15,000 volunteers as a way to get people talking (and laughing) in all 50 states. We'll continue to encourage other groups to tackle overpopulation this year. We'll distribute hundreds of thousands of condoms and ramp up the overpopulation dialogue through high-profile projects, including a study on the connection between overpopulation and diminishing water supplies in the Lower Colorado River Basin, the Center's unique newsletter, Pop X, and targeted actions to Congress. Check out our Endangered Species Condoms Project and learn about overpopulation and the extinction crisis. Sign up here to receive Pop X. The new Congress is already taking aim at the Clean Air Act -- one of the most important laws for combating climate change. The attacks will grow worse as the Environmental Protection Agency begins to use the Act to limit greenhouse pollution. The Center for Biological Diversity will fight hard in 2011 to make sure the power of the Clean Air Act isn't gutted or diluted by hostile politicians or weak compromises. Our warming planet can't afford half-measures or more delayed action. Here's why: Global warming is no longer just a problem for future generations -- it's a global crisis with devastating consequences already being felt today. Look no further than the plight of polar bears in the Arctic, whose sea-ice habitat is melting rapidly, leaving bears to starve and drown. Congress failed to pass any new climate legislation in 2010; we won't let them use 2011 to weaken one of the few laws left to combat this worldwide crisis. Get the rundown on the critical importance of the Clean Air Act. Then sign our People's Petition to Cap CO2 Pollution at 350 ppm to avoid catastrophic climate change. If the oil spill disaster in the Gulf of Mexico made one thing clear, it's that offshore drilling is deadly dangerous. Birds, sea turtles, tuna and oysters -- and the local communities and economies -- paid a terrible price after the BP spill, and the Center for Biological Diversity is determined to prevent a repeat of that kind of environmental disaster. Already, we've forced reforms in how the government regulates offshore drilling and celebrated court victories blocking offshore drilling in Alaska and stopping expansion in the lower 48 states. In 2011, we're redoubling our efforts to protect places like the Arctic, where an offshore spill in frigid waters would devastate polar bears, beluga whales and sea lions. While we're pursuing multiple lawsuits to hold BP and the government accountable for the Gulf disaster, we'll push for a permanent ban on offshore projects in Alaska. Learn about our work against oil and gas development and check out our Gulf Disaster website. Since winter 2006, more than a million bats in 11 states and two Canadian provinces have died from the mysterious disease called white-nose syndrome. The fungus believed to cause the malady has been found on bats in three other states, with the westernmost site now in Oklahoma. The disease is spreading at a frightening pace with no cure in sight, creating an epic emergency for the night creatures we rely on to keep insect populations in check. Yet the federal government still hasn't taken the steps now needed to confront one of the worst wildlife declines in North American history. The Center for Biological Diversity fought white-nose syndrome hard throughout 2010 to stop transmission of the disease, invest in more research for a cure and educate the public and Congress about the bats' rapid decline. This year we'll advocate for more precautionary cave closures, defend bats doubly threatened by white-nose syndrome and habitat destruction, and continue to call for stronger protections for plummeting bat species. Learn more about white-nose syndrome and the Center's leading work to save bats. Last year Interior Secretary Ken Salazar relegated 254 imperiled plants and animals to the federal "candidate list" instead of actually protecting them as endangered species. "Candidates" are not afforded any protection against habitat destruction or killing. The 254 species, from the white fringeless orchid to the Oregon spotted frog, have been declared by U.S. Fish and Wildlife Service biologists to be going extinct; yet on average, they've been waiting 20 years for protection. Twenty-four have paid the ultimate price of delay, going extinct while on the candidate list. This year the Center for Biological Diversity will continue our comprehensive litigation to earn safeguards for all 254 candidate species. And, having hired the nation's first attorney devoted exclusively to defending herpetofauna, we'll be ramping up campaigns to protect sensitive reptiles and amphibians. We'll also work to make sure 404 southeastern aquatic species on the brink of extinction are saved. Read about our Candidate Project and the Southeast freshwater extinction crisis. Then take action to tell the Obama administration to protect all 254 candidates. Every day millions of frogs, birds and other animals are poisoned by toxics put into the wild by humans. That's why the Center for Biological Diversity has launched massive campaigns to save endangered species around the country from pesticides and lead used in ammunition and fishing tackle. This year we'll be in court fighting the EPA's political denial of our petition to ban lead in fishing gear and shot. Our petition, armed with nearly 500 studies highlighting the harm toxic lead causes to wildlife, would finally put an end to this preventable epidemic that kills 10 million to 20 million birds each year, including eagles and California condors. We'll also go after the EPA in the courts for approving hundreds of pesticides without considering the catastrophic harm they cause to frogs, fish and other wildlife around the country. Learn about our fight against toxic pesticides and getting the lead out of the wild. The Center for Biological Diversity won a landmark agreement in 2010 that will protect more than 900,000 "roadless" acres in Southern California from road-building and other activities, saving California condors, arroyo toads, steelhead trout and others from vehicle-caused habitat destruction. We also stopped road-building in parts of New Mexico's San Francisco River -- home to the Chiricahua leopard frog and southwestern willow flycatcher -- and forced Arizona's Tonto National Forest to take a hard look at road impacts on air quality, wildlife and archeological sites. In Arizona, California, New Mexico and Nevada, the Center is continuing our crucial work to close at least 6,770 miles of roads that are degrading our public lands and harming endangered species. We'll protect wolf habitat from ORVs in Arizona's Gila National Forest and continue our suit to overturn a Forest Service decision to add 220 miles of ORV-created routes to California and Nevada's Humboldt-Toiyabe National Forest to save the Mono Basin sage grouse, pygmy rabbits, rare alpine plants and other species from vehicles' churning wheels. Learn more about our off-road vehicle campaign, Southern California forests, our campaigns in Nevada and responsible travel-management planning. In 2010 Center for Biological Diversity supporters took more than 1.1 million online actions to save animals and plants, protect precious wildlands and fight for a healthier climate. Almost 72,000 of you emailed the Obama government to oppose offshore drilling after the BP Gulf of Mexico oil spill. More than 36,000 told the feds to end devastating mountaintop-removal mining, and 61,500 signed our People's Petition to cap CO2 at 350 ppm. These actions make a huge difference, putting pressure on Congress and other decision-makers to fully protect wildlife and wild places: Just days after 150,000 people signed our online petition to stop the burning alive of sea turtles during the BP disaster, the federal government passed measures to stop it. In 2011, with your help, we'll grow our network of 315,000-plus supporters and generate 2 million emails, phone calls and letters to decision-makers asking them to stand up for our environment. If each of you gets one other person to join our e-network, we can double our impact. If you get three people to join, we can quadruple it. Help us do our best work ever in 2011 by taking all the actions in this newsletter now. Then get everyone you know to join you, share this on Facebook and see the difference we can make together. If we all join in the effort, we will curb the extinction crisis and protect the planet's biodiversity for the future. Thank you for helping us do more for polar bears, bats, the white fringeless orchid and hundreds of other species. Photo credits: loggerhead sea turtle courtesy Flickr Creative Commons/mattk1979; polar bear (c) Brendan Cummings; gray wolf courtesy Flickr/keith011764; bluefin tuna courtesy NOAA; overpopulation courtesy iStock/mura; smokestacks courtesy NASA; oil platform courtesy Wikimedia Commons/Divulgação Petrobras/ABr; gray bat courtesy USFWS; Oregon spotted frog by Kelly McAllister, Washington Department of Fish and Wildlife; California condor courtesy Arizona Game and Fish; ATV courtesy Wikimedia Commons/Myke2020; loggerhead sea turtle courtesy Picasa Creative Commons/Joseph and Farideh. The Center for Biological Diversity sends newsletters and action alerts through DemocracyinAction.org. Let us know if you'd like to change your email list preferences or stop receiving action alerts and newsletters from us.